I take my christmas decorating very seriously. It is a tradition that I have created for myself and my family and I look forward to it year after year. My oldest daughter has inherited my love of christmas decorating and this year we are starting a hope chest of sorts for her own holiday decorations. Every year since my children were born my husband’s family has traveled to our house to share the holiday with us. As we have moved around the past few years the Spence christmas celebration has traveled from Virginia to New Jersey to Ohio and now back to Virginia. 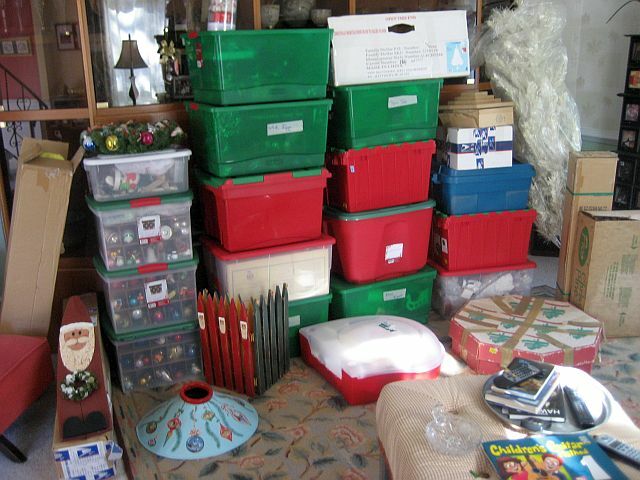 In spite of 4 moves in 5 years my collection of all things christmas has grown and grown. So I start my annual ritual of decorating every room in the house. I think my tree count is up to nine, that is not counting the gumball tree that we make for the inside of the fridge. Always puts a smile on everyones face to open the fridge and find a tree in there too! Call me crazy, but I love all the tinsel and glitter, the kitsch and the elegant. Pretty much never met a decorated christmas tree that I didn’t like. As I get the decorations going I will share them all here in my blog. Here are most of the boxes that came out of the attic today. Let the decorating begin! Love the banner! We are a day ahead of you. Bruce is leaving for Zurich tomorrow, so I had to get those containers upstairs early. I think we can match you on them. I will be watching for the great tree unveiling…some people have the night of the seven fishes…some people have the holiday of nine trees. Happy decorating! I have been to Smithfield, but don’t recall seeing this shop. I will be sure to look for it now. Thanks for the 411! What a great idea! We haven’t gotten our boxes down yet, but I’m inspired! Except that I still need to finish painting the living room. Yipes! Thanksgiving weekend always kicks off the season with warm food, good friends and a chill in the air. I too cherish the ritual and tradition of decorating for this wonderful time of year. Enjoy!! Yay! Christmas trees!! I love decorating for the holidays. Opening the boxes full of trim and tinsel always makes me feel like a little kid. For me, it’s one of the best parts of the holiday….the decorating!! I look forward to seeing all your trees!! wow glad to see that the Christmas decorating bug is alive and well in the south!